Since December 2015 there has been a DFARS clause (225.204-7012) requiring contractors to institute the standards outlined in NIST Special Publication (SP) 800-171. There was an implementation window of two years, and that window runs out as of December 31st, 2017, making compliance with SP 800-171 a full-stop requirement. If you’re coming at this new standard from the mobile device perspective there’s a few different areas that we think are particularly relevant and interesting to understand, namely Access Control, Audit & Accountability and Media Protection. We’ll review the key section for mobility below. Protect and control mobile devices when outside of controlled areas. Ensure you understand which devices are approved and which aren’t, and don’t allow unapproved devices to mount their filesystems. Highlight: secRMM has the ability to unmount non-whitelisted devices from the operating system, allowing users to charge but not transfer. See it LIVE here. Ensure you limit or remove the use of portable storage devices, but if they are used ensure you appropriately track Controlled Unclassified Information being transferred to the devices. Highlight: secRMM can limit the use of portable storage devices using whitelisting policy rules such as AllowedSerialNumbers, AllowedInternalIds, AllowedUsers, AllowedPrograms. See it LIVE here. Ensure you have audit records that track any device connections or transfers of Controlled Unclassified Information, including the full range of audit details to track the 4W’s (who, what, where, when). Highlight: All required data is collected by secRMM, and audit event data is stored in Windows “event log files”, easily allowing both centralized log storage and historical archival. Ensure you define safeguards around which devices can connect to which systems, and that devices with no identifiable owner cannot be used. Highlight: A large range of removable media devices can be whitelist controlled via secRMM, including USB/thumb drives (encrypted and non-encrypted), mobile devices (Apple, Android, Windows, BlackBerry), external hard drives, CD/DVD/BluRay and SD-Cards. Requiring identifiable owners for portable storage devices reduces the risk of using such devices by allowing organizations to assign responsibility for addressing known vulnerabilities in the devices. Ensure you block devices where an owner cannot be associated with connection or data transfer events. Highlight: There are two key mechanism in secRMM which can map identifiable owners to devices, and can force users to authenticate from mobile devices to successfully connect. See AD Integration LIVE here. Protect the confidentiality, integrity, and availability of backup information at storage locations. Ensure that all security and audit information related to mobile devices or portable storage devices is redundantly backed up, stored securely, and the integrity of the backups is assured. Highlight: All secRMM event data is contained in standalone Windows Event Log Backup files (evtx) files. These files are easily compressible using COTS compression software which can be password protected and encrypted when necessary. By December 31 of this year you must be compliant with NIST 800-171. There are implications for mobility and portable media, and we hope that the outline above simplifies the key requirements that you need to keep in mind. Our secRMM product is a COTS product specifically designed for governments to meet the kind of stringent criteria that NIST publications require. July 01,2017 Update: See how System Center Configuration Manager (SCCM) can handle mobile device “side-loading” in this YouTube video. June 13, 2017 – secRMM has added a new utility called SafeSync. SafeSync lets you install mobile device apps and of course securely copy files to the mobile device. Sometimes it makes sense to install a mobile app without going through the trouble of getting the mobile app published into the “app stores”. App stores are big databases accessible over the internet that let users select apps to install onto their mobile device. Anyone can access the app stores as long as the mobile device has an internet connection (using the devices WiFi and a hotspot or the cellular service providers network). Apple, Google and Microsoft have the biggest app stores. These software vendors offer apps for their mobile devices hardware and/or operating system. When you want an app to go into one of the app stores, you have to go through a process defined by the vendor before it can be published. There are scenarios where an organization does not want to put their apps into the app stores. Mainly because they do not want just anyone to be able to use the apps. As an example, suppose the military were to develop some apps that helped them with field combat. Clearly, they would not want just anyone to be able to download their app from an app store. Another example is a company that writes apps for their workers to use. Perhaps the app has company sensitive information that needs to be protected from competitors. For scenarios where you want to distribute a mobile app but do not want it in the app stores, a common and acceptable practice is install the app from another computer (commonly a Windows computer). The Windows computer and the mobile device cooperatively perform the install using a USB cable connection between them. The computer industry uses a slang term called “side-loading” to describe this process. The app (which is just a binary with a special extension) can reside on the Windows computers local hard drive or even on a network share (so many users can access it). The secRMM SafeSync utility makes it easy to manage the side-loading process by providing a list of available apps which you can choose to install, uninstall or re-install. In addition, the mobile app install or uninstall events get recorded so that security administrators can be aware of the activities. Because of secRMMs integration into System Center (and other backend monitoring systems), this event information can be included in the organizations security monitoring process. SafeSync can also generate a script so that the install/uninstall/reinstall pattern can be repeated for many devices. SafeSync also exposes the mobile device properties which are important to understand and control before a device is deployed into the field. Lastly, SafeSync can copy files to the mobile device. 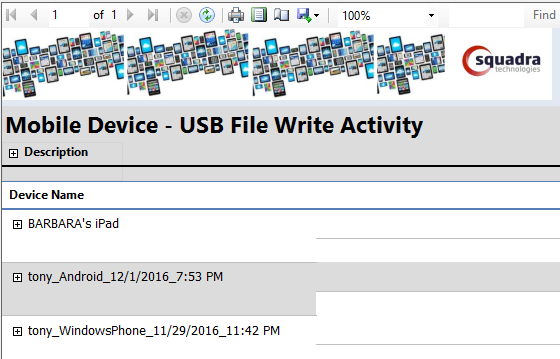 These files might be data files that are used by the mobile apps. This allows a device to completely be prepared before it gets deployed into the field. In summary, secRMM continues to help IT organizations and security professionals manage the events around removable storage and especially mobile technology. Please feel free to contact Squadra Technologies to help with your security needs around removable storage and/or mobile device technology. There is also a YouTube video about SafeSync at https://www.youtube.com/watch?v=Z2_ODEnr2XM. December 15, 2016 – Being in the Microsoft System Center space is very exciting. You get to work on leading edge software that helps your business operate and be successful. System Center provides so many functions and features that sometimes getting a handle on all the bells and whistles it provides can be a little intimidating. This is when you wish there were experts you can lean on to help you understand or even help you accomplish your System Center goals. If you don’t know of any System Center experts, please check out one of Squadra Technologies technology partners named “Windows Management Experts” or WME for short. Let me just tell you, these guys know System Center and they are cool guys. For example, we just released a SCCM/InTune report for secRMM. I was trying to understand the SCCM database schema to figure out how to pull the data for the report. I shot an email over to my buddies at WME and within a day, they emailed me back an SQL query (quite complex one I might add) that enabled me to finish the report within a couple of hours! So awesome! So, if you are looking for System Center help, please consider WME. September 06, 2016 – secRMM has added another security rule which does not really fall into the Data Loss Prevention (DLP) category but more in the antimalware category. The new rule is named “BlockOfficeMacrosOnDevice”. As the name implies, secRMM will block opening any Microsoft Office document residing on a removable storage device that has a macro(s) embedded within it. Another good thing about the secRMM “BlockOfficeMacrosOnDevice” feature is that it supports Office 2016, 2013, 2010, 2007 and 2003. It probably supports even older versions but we could not find an older version than 2003 to install and test with! If you are concerned about Macro-based malware, now you can have this additional help by using secRMM. The screenshots below will show you what we discussed above. In the first 2 screenshots, we are just turning on the rule (we used the “Computer Management” MMC). It is just a checkbox, on or off. You must be an Administrator on the computer to be able to access the secRMM rules. The next 3 screen shots show you what the end-user will experience when they go to open an Office document with a macro(s) embedded within it. The first 2 screen shots are from explorer. The third screen shot is if they try to use a command window. Note that this blocking functionality will also apply if they first open the Office program and then do a File->Open operation from within the Office program. Now, as the IT and/or security Administrator, you will also be able to see in the event log that this condition has occurred (i.e. an end-user tried to open an Office document on a removable storage device and the Office document had a macro(s) embedded within it). The screen shot below has a lot of information contained within it. 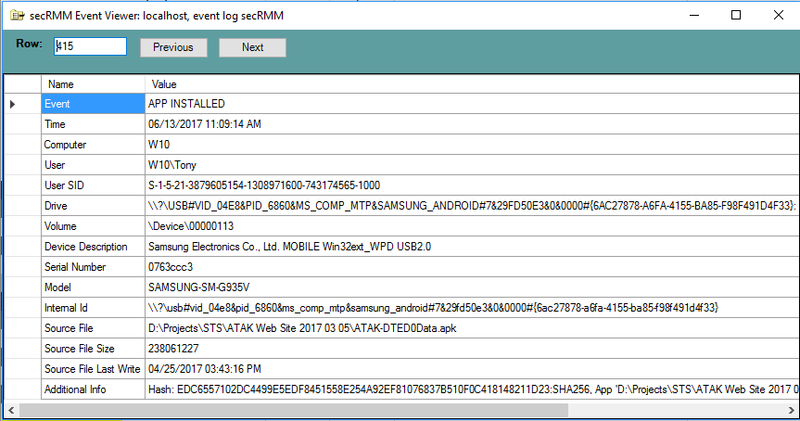 First, it tells you that a “BLOCK MACROS ON DEVICE ACTIVE” event occurred (in the secRMM event log, that is event id 514). It tells you the user who tried to open the Office document (in the screen shot, this is CONTOSO\Angela). Next, it tells you about the removable storage device. Next, it tells you the program that tried to open the Office document. In this case, it is Winword.exe. The last line is kind of long but it is really the most detailed so we break it down below the screen shot. The text above logs what the “command line” looked like when Windows tried to open the Office document. It also logs the “current directory”. Lastly, it lists the macro information contained inside the Office document. In the above event, we can see that inside this Word document, the “ThisDocument” VBA object has a macro of type “Document” and there are 3 lines of executable code. There is also an object named Module1 which has a macro of type “Code” and there are 14 lines of code. Below is a screen shot of the Word document used in our example with the Visual Basic Editor open so you can see why secRMM listed what it did. Description=Programmatic access to Visual Basic Project is not trusted. this means that the Office program does not trust macros so secRMM could not parse the file for macros. What?!!! Right, it sounds crazy but secRMM is not doing anything out of the ordinary to obtain the information about the macros. This message means there ARE macros but secRMM is not allowed to look at them. You can try secRMM for 30 days (fully functional). Please visit the Squadra Technologies web site to download secRMM. Apricorn is a removable storage hardware vendor that Squadra Technologies has had the privilege of partnering with over the last several years. The two companies now have a jointly developed version of secRMM that is called “Apricorn secRMM” (internally named secRMM-lite so we may slip up and call it that too 🙂 ). “Apricorn secRMM” is free software offered by Apricorn and supported by Squadra Technologies. “Apricorn secRMM” lets Apricorn customers configure their Windows workstations and servers to allow just Apricorn devices to be used by end-users. This is a very powerful capability since it narrows down the removable storage devices allowed in your environment to only hardware encrypted, password protected devices! The first two properties (AllowedInternalIds and AllowedSerialNumbers) constrain the Windows computer to only writing files to Apricorn devices that meet both properties. Trying to write to any other type of removable storage device will fail. The AllowedSerialNumbers can be left blank which will allow any Apricorn device. The SCCMConnection property will allow integration into Microsoft System Center Configuration Manager (SCCM). Note that “Apricorn secRMM” will also work with the secRMM Microsoft System Center Operations Manager (SCOM) Management Pack(s) as well. 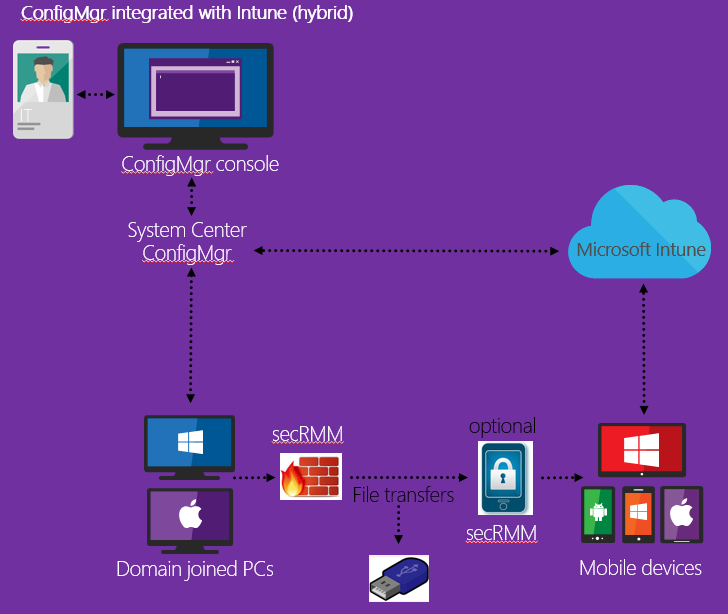 For complete details on Microsoft System Center integration, please visit http://squadratechnologies.com/Products/secRMM/SystemCenter/secRMMSystemCenter.aspx. The SNMP property will throw SNMP “Apricorn secRMM” traps to a SNMP trap receiver computer. “Apricorn secRMM” generates audit events for all removable storage ONLINE and OFFLINE events. Please note however that it will not generate file WRITE events (whether successful or unsuccessful). To get file WRITE events (and the other secRMM events), you will need the secRMM full version. When you first install “Apricorn secRMM”, you will have 30 days to trial the software. During the 30 day trial, you will have the ability to toggle the software between the “Apricorn secRMM” version and the full version of secRMM. This will help you decide if you can do without the additional functionality that the full version of secRMM provides (i.e. advanced auditing, additional authorization properties, user configurations, etc.). If/when you decide that you would like to use the software (either “Apricorn secRMM” or the full version of secRMM) in your environment, please contact Squadra Technologies (sales@squadratechnologies.com) to obtain a license (either for free or to start a purchase). If you decide that you want to purchase the full version of secRMM, you will need to tell Squadra Technologies how many computers you have in your environment that will run secRMM. The number of computers dictates the purchase price. The more computers, the less “per computer” price. Squadra Technologies is very excited to be working more closely with Apricorn and Apricorn customers! Please feel free to contact us (sales@squadratechnologies.com) anytime if you have questions about using “Apricorn secRMM” or the full version of secRMM.